Thousands of happy holidaymakers make their way through Portugal’s airports every week ready for a fantastic time in this unique European destination. The Portela Airport in Lisbon, an important junction for intercontinental flights, is the base of the Portuguese airline Transportes Aéreos Portugueses (TAP), which provides schedule services. Important secondary airports are located at Porto and Faro. Once you have arrived in Portugal there are several different transport options for getting around. Here are a few of them. As for Portugal’s roads, they have come a long way since the 1970s with major development of motorways and important roads around the country. A four-lane auto-estrada (superhighway) connects Lisbon to Porto, the capital of the north and similar routes have been constructed from Porto and Lisbon to Spain. Highways connect the largest towns and extend to the border and ports. There are many other highways around Portugal, all roads starting with ‘A’ (auto-estrada) have four lanes. Secondary roads link the towns with almost every part of the interior and several of the country's main roads date back to ancient times. CP – Comboios de Portugal (Trains of Portugal) provides the national railway service. There is a considerable network covering the mainland as well as international trains travelling to Madrid, Vigo and Paris. Different types of trains travel to different areas with all major cities and towns being connected. They are a fast, comfortable, punctual and a relatively cheap way of travelling. Taking a bus can be a cost-effective and convenient way to get around. You will see bus stops all over the major towns and cities of Portugal. Many visitors like to experience this way of travelling and take advantage of inexpensive tickets. There are major seaports in Leixões, Aveiro, Lisbon, Faro, Figueira da Foz, Sines and Setúbal. In addition to the rail network above ground there is an underground network that operates in Lisbon and Porto between 06.00 hrs and 01.00 hrs. The capital’s network spreads out across the city and is a great way to explore Lisbon. Some of the stations are decorated with colourful painted tiles that transform them into works of art. If you would like someone else to take the strain of driving, finding a taxi is easy in Portugal. Look out for cabs that are usually all over the place. They are normally cream in colour or the more traditional taxis are painted black with a green roof. As usual, the fare is displayed on the taximeter which increases as the journey continues. You can always ask the driver for an approximate price for a particular journey beforehand to get an idea of how much it will cost. An additional fee is added when you telephone for a taxi in advance, and luggage (regardless of size and weight) carries an extra price as well. A great way to explore the charming offerings of Portugal is by hiring a car. There is nothing like getting behind the wheel and taking to the road yourself without having to rely on anyone else! 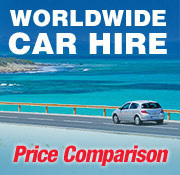 If you would like more information about how to rent a car and get a competitive quote, click here.